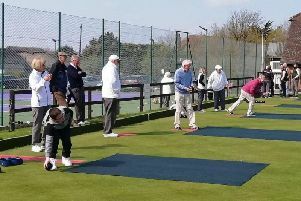 The Bognor Tuesday Double In Double Out season ended with a blind pairs knockout followed by the trophy presentation at the Newtown Social Club. A total of 58 players took to the oche for the knockout, just two short of the record. The first semi-final saw Phil Hayers (Neptune) and Lee Clark (POW Bognor) beat Wayne Wadsworth (Wheatsheaf) and Keith Robinson (Chi Snooker). In the second, Andy Whiteley (QE2 Stiffs) and Steve Aizlewood (Newtown SC) lost out to Dave Bourne (Richmond A) and Andy Stubbs (Hunston Club). The final’s first leg saw Bourne hit 85, Hayers 100, Stubbs 140 and Clark reply with 140. Both teams struggled to finish, but Hayers needed only one dart on double five to take the leg. The second leg saw Stubbs start with a 112 in-shot and Bourne follow with a ton. Clark struck 125, but Stubbs hit 95 to keep the lead. Then it went wrong for Hayers and Clark with both hitting scores of 11. This gave Bourne a lift, and with 90 left all he needed was two darts to take the leg. The third leg was even all the way to the double, but Bourne and Stubbs made a mistake, giving Clark two darts to see the leg off. Hayers missed the double by a mile with his first dart, but not the second, taking the leg and the match. Leg four saw Hayers and Clark struggle to get in, with Clark eventually hitting a 105 in-shot. By that time Bourne and Stubbs were far in the lead, and it took Bourne only three darts to take the match to the last leg. Hayers & Clark weren’t messing about, and with Clark starting with a 110 in-shot, Hayers followed with a 140. Meanwhile Stubbs slipped with a small score, but followed his team-mate’s ton on his next throw with one of his own. Bourne and Stubbs were slowly catching up and after both Hayers and Clark just missing the double, and Bourne had a chance of a 98 finish. He hit single 20 and treble 20, but his last dart wired the double nine. Hayers missed the double by a mile with his first dart, but not the second, taking the leg and the match and sharing the winners’ jackpot with Clark. Once again an excellent selection of trophies for the presentation were supplied by C&M Trophies of Littlehampton. Final league positions: Div 1 Winners (Overall, Singles, & Pairs) - POW Bognor; Runners-up (Overall, Singles, & Pairs) - QE2 ‘A’. Div 2 Winners (Overall, Singles, & Pairs) - QE2 Stiffs; Runners-up (Overall, Singles, & Pairs) - Lamb Steyne.